It’s been a busy month for John and Belle. Certain difficulties involved, as you can see from the photo. Hope it’s been a good month for you and yours and that Santa brings you many appropriate gifts. Thanks John, same to you. Santa knows me pretty well so he’s been doing a lot of shopping at Kontakt Hub recently. As for you, I hope he doesn’t bring you a giant duck because it seems that you already have one. Or maybe you do need another one, one for each rider. I’m sure he’ll do the right thing! My best wishes for you and Belle and your family. Hope to hear more from you both in the new year. Best wishes for your family. Love the amphibious transportation and its retro styling! 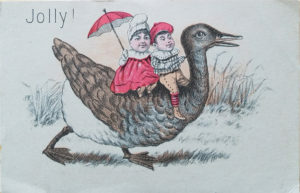 I’ve posted a few Christmas cards from a family album for the year 1908 on my Flickr page. We’re having goose for dinner. Wild rice and mushroom pilaf, roast veg and red wine gravy. We have some bubbly in the fridge. Then our friends are coming over with dessert. I’m going to have to go on YouTube to find out the proper way to carve a goose. Greetings for the solstice season to all. It seems that your personal transport tech is a little out of date. But, at least you should turn heads when you stride by. And its amphibious too! Merry Christmas John and Belle and (esp.) littles! If it walks like a giant duck and quacks like a giant duck . . . it is quite clearly a cybernetic assault vehicle / jumbo-sized pet. Interesting choice of image. The largest sum of suffering caused by any human activity today is likely the suffering inflicted on birds. Yet that is commonly ignored. Many instead think of the harmful animal exploitation as something normal, natural and necessary and portray the victims as enjoying the exploitation. Which the image captures well. And there is also this on how the industries that harm and exploit animals operate through the state.